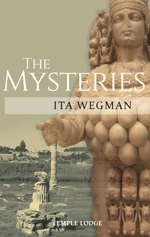 This unique collection presents Ita Wegman’s principal writings and lectures on the Mysteries – both the Mysteries of the ancient world to which she felt personally connected, and the spiritual science of anthroposophy, which she saw as the contemporary form of Mystery wisdom. The volume begins with Ita Wegman’s firsthand account of Rudolf Steiner’s final days and hours on earth – written immediately after his death in 1925 – followed by several of her powerful letters ‘To All Members’ and their related ‘Leading Thoughts’. Various longer studies are featured, including her lecture ‘A Fragment from the History of the Mysteries’ – delivered at the opening of the second Goetheanum in 1928 – articles on Ephesus and the Colchian Mysteries, and personal impressions of Columba’s Iona, the island of Staffa (with its initiatory Fingal’s Cave), and Palestine, the land where Christ once walked the earth. These writings – several composed specifically for an English readership – bring us closer to the inner being of Ita Wegman, offering insight into her knowledge, vision and understanding of anthroposophy. Her stimulating ideas throw light on the transformation of the ancient Mysteries to anthroposophical knowledge and activity today. ITA WEGMAN, MD (1876 - 1943) was co-responsible for founding Anthroposophical Medicine alongside Rudolf Steiner. Born in the Dutch East Indies, she trained in gymnastics and massage and later medicine. She founded the first anthroposophical medical clinic (now the Ita Wegman Clinic), created a gentle form of massage therapy (Rhythmical Massage), and developed a cancer treatment following indications from Steiner based on mistletoe (Iscador). She also founded a therapeutic home for mentally handicapped children (Haus Sonnenhof) and co-founded a pharmaceutical laboratory (Weleda) that is now a major producer of medicines and healthcare products. In 1923 Ita Wegman joined the Executive Council of the newly reformed Anthroposophical Society at the Goetheanum in Dornach, Switzerland, where she directed the Medical Section. Wegman and Steiner co-authored Extending Practical Medicine, which gives an introduction and theoretical basis to Anthroposophical Medicine. She is also the author of Esoteric Studies, The Michael Impulse.